Whatever BMW does, it does in style! The iconic carmaker's exhibition centre, called the BMW Welt -- or BMW World, provides an awe-inspiring experience for customers and helps the company display its offerings in a dreamlike, almost other worldly, setting. It sits cheek by jowl to the BMW headquarters in Munich, Germany. 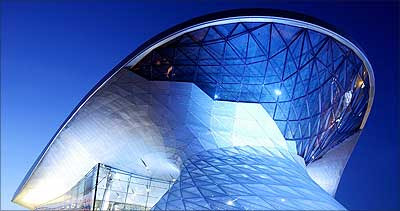 The magnificent building was designed by architects Coop Himmelb(l)au for the BMW Group. As many as 275 architecture firms submitted tenders for the BMW Welt, but in a unanimous decision the winning design was by Professor Wolf D Prix and the Viennese architecture firm Coop Himmelbau. After 800,000 hours of planning, and 120 architects and engineers collaborating to prepare 15,000 plans, the Munich Olympic Car Park was demolished on August 1, 2003 to make space for the construction of BMW (Welt) World. On July 16, 2004 the first stone was set, and the final interior touches were given in June 2007. BMW Welt was open to the public in October. 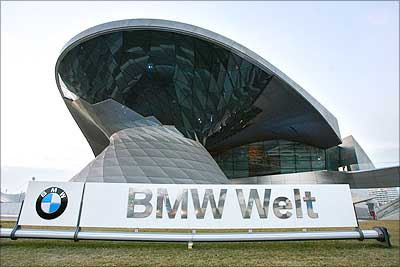 The BMW Welt is located at the exact site where the company has had its base for 90 years: on the Oberwiesenfeld in Milbertshofen, right beside the BMW Group headquarters, which is a 4-cylinder building, and the BMW Museum. In early 20th century, Oberwiesenfeld was used as an airstrip and two aviation pioneers founded their companies here. Gustav Otto founded Flugmaschinenfabrik (Flight Machine Factory) and Karl Rapp founded Motorenwerk (Motor Works). In 1917, the two companies merged to form the Bayerische Motoren Werke (Bavarian Motor Works, or BMW). The building has a huge solar power plant on its roof, lending it a futuristic, green look. In addition to the various presentations, multi-media displays and exhibits about BMW cars and motorcycles, the main function of BMW World is to serve as a highly personalised delivery point of new cars to their owners. 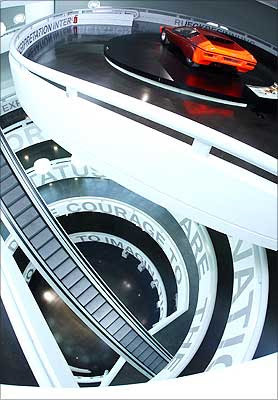 Image: BMW World is multifunctional, combining car delivery and museum. 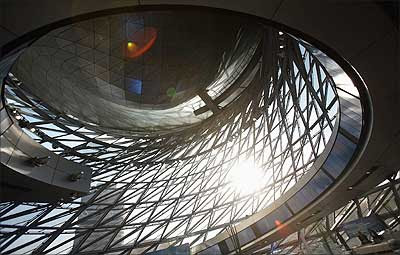 The Plaza within the BMW Welt is the ideal starting point for touring all parts of the building and provides an overview of the very unusual architecture and the various areas within this unique achievement in modern design and engineering. 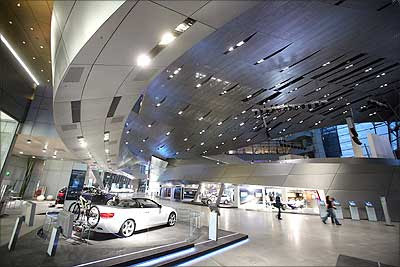 Image: Interior view of the BMW World. Directly next to the Northern Entrance the presentation of BMW cars starts at the right, with cars from all current model series being presented in the BMW Welt. The Bistro is to the left, the Junior Campus a few steps further on to the right. The latter is a special encounter and event area for children and young people between 7 and 13. BMW Welt Technology and Design Studio is where the enthusiast wishing to experience BMW's art of engineering and design will receive a comprehensive insight into new developments, enjoying interesting exhibitions and interactive exhibits. The BMW Lifestyle & Original Accessories Shop within the BMW Welt is just a few metres behind the Junior Campus. Here, aficionados of the brand, sophisticated accessories or Formula 1 will find a unique range of equally unique products. And this is also where the customer picking up a new car is able to buy accessories on the spur of the moment, such as a roof rack for bicycles or child seats fitted into the car right on the spot. 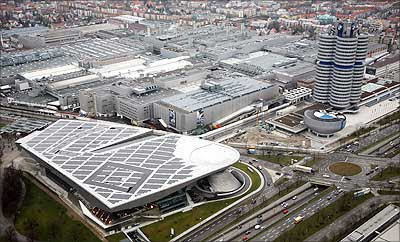 Image: General view of the BMW car producer headquarter, BMW plant and BMW World. 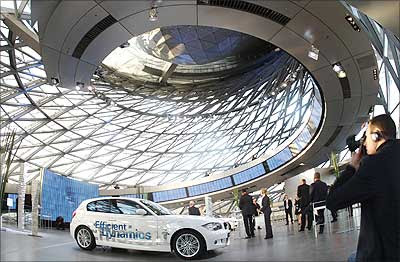 The Double Cone structure of the BMW World serves as the ideal venue for exclusive cultural events. The Premiere Level, the very heart of the Car Delivery Centre, is right in the middle of the BMW Welt, directly above the Technology and Design Studio. BMW Munich Plant builds more than 800 BMW 3 Series (Touring and Saloon models) as well as more than 1,250 power units (straight-six, eight-cylinder gasoline and diesel engines, high-performance M-engines for the M3, M5, and M6, as well as twelve-cylinder gasoline and hydrogen engines) a day. 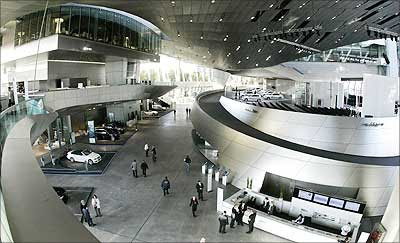 Image: BMW's 'BMW World' complex in Munich built by the architects of Coop Himmelb(l)au and inaugurated in October 2007. 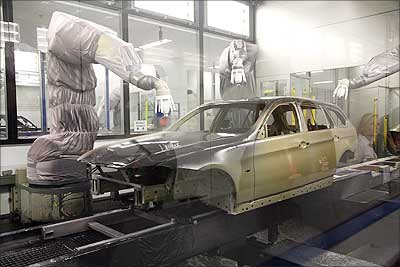 As a building and an institution, the BMW World is a significant interface between the company, the brand, the products, and the surrounding world. This is indeed the only place able to offer an overall, all-round experience of the past, present and future of the company. 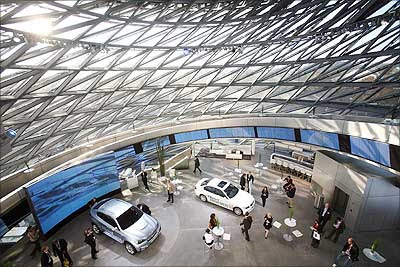 Image: Interior view of the BMW World, seen prior to the opening ceremony on October 17, 2007 in Munich, Germany. 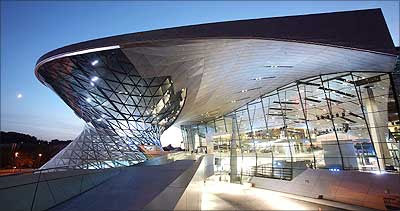 The BMW Welt is open to public from 9.00 in the morning to 8.00 in the evening. Car buyers can collect their new automobiles at the BMW Welt from Mondays through Saturdays, as early as at 7.00 in the morning. However, customers cannot take delivery of new automobiles on Sundays or public holidays. 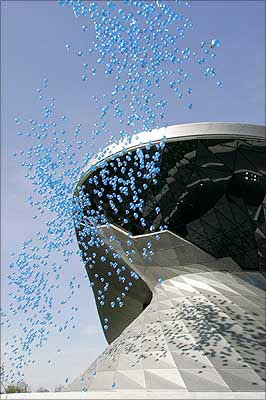 Image: Balloons fly during the inauguration festivities of the new 'BMW World' of German luxury car maker BMW.